In a world where metal replaces skin, action-adventure film “Alita: Battle Angel” brings new meaning to “tiny is mighty” through its female heroine. The film takes place in a steampunk future, featuring a mix of cyborgs and humans in the Iron City, a teeming concrete jungle that serves as a dumping ground for the elites in the floating elysium above. Among the scrapyard, the film finds its cyborg protagonist, Alita (Rosa Salazar), with amnesia and the will of a tenacious hero who fights to protect her loved ones. Alita’s passion entranced me, and the graphics shocked me. The pacing was unparalleled, setting up an enthralling introduction to a new world. The film follows Alita on her quest to uncover her pasts. After Dr. Ido (Christoph Waltz) finds her broken, cyborg body in the scrap yard and repairs her, Alita starts life with little knowledge of who she was. In perilous situations, Alita begins to remember her past in fragments. As she explores the Iron City, she meets her love interest Hugo (Keean Johnson) and learns that she has incredible battle instincts when she recklessly dives under a colossal, robot policing monitor to save a dog. Soon after, despite her petite size, she saves Ido from a towering group of criminal cyborgs in a stunning show of long-lost martial arts techniques. In the hopes of triggering more memories, she enlists as a hunter-warrior, a bounty hunter who kills criminals for a quick payout, alongside others like Ido and Zapan (Ed Skrein). But a corrupt businessman, Vector (Mahershala Ali), and Ido’s estranged wife, Chiren (Jennifer Connelly), who work for a mysterious master in the utopia above Iron City, send criminals to stop her. As Alita battles these criminals, she pieces together who she was and wants to be now. Salazar’s and Skrein’s emotional performances really stood out. Skrein plays a villainous, hunter-warrior cyborg whose only human skin was on his face. From Zapan’s nefarious side-eyes to his appalled look when Alita smashes his nose, Skrein did a phenomenal job at maintaining a despicable atmosphere in all of his interactions. Often villains can seem repetitive and unoriginal, but Skrein’s charisma makes the character shine. On the other hand, Salazar’s performance was also exceptional, since her emotion had to be conveyed through digital editing. Every scar, facial tic and yearning look was shown digitally on the screen. However, a scene earlier in the movie where Alita looks with self-introspection and wonder at her newfound body holds so much emotion that the audience feels like they could be in the room with her. Alita showed her growth as a character and her intense emotions in her performance; it was stunning. Alita’s soft side is revealed through interactions with her love interest, Hugo, which spurs ethical questions regarding the social etiquette between cyborgs falling in love with humans. The movie brushes over the topic, missing a great opportunity to develop the potentially taboo societal expectations and fulfill the common forbidden love trope. Answering the ethical expectations on these relationships in the Iron City could have given Alita and Hugo a reason to stay together for love, despite expectations, making their short romance more believable. Their love connection felt manufactured and forced at times, since Hugo was the first boy Alita met and the movie failed to develop much of a reason for their relationship other than to further the plot. Alita always shows emotion and passion in her looks at Hugo, but his performance lacks the devotion needed and makes the audience question if he actually loves Alita or has ulterior motives. With stunning graphics and CGI, “Alita: Battle Angel” does the impossible by making the viewer forget that the main character is a CG creation. Reminiscent of the styling of characters from “Ready Player One,” the film makes the animated main character appear like flesh and blood. After the credits of the film, the cast and crew discussed the difficulty in portraying this story through a live action film. They discussed the fact that Salazar had to wear a full body suit and two cameras over her face to document all of her bodily and facial movements. The film crew worked hard to perfect what they called “performance capture,” not just motion capture, by documenting the details of Rosa’s facial movements using the two cameras. The details in Alita’s face or even the beauty in the cinematography and background in the opening scene are all dazzlingly intricate. The film opens on a orange-hued, disheveled scrap-yard, filled with used gadgets, reminiscent of “Mad Max”’s setting. 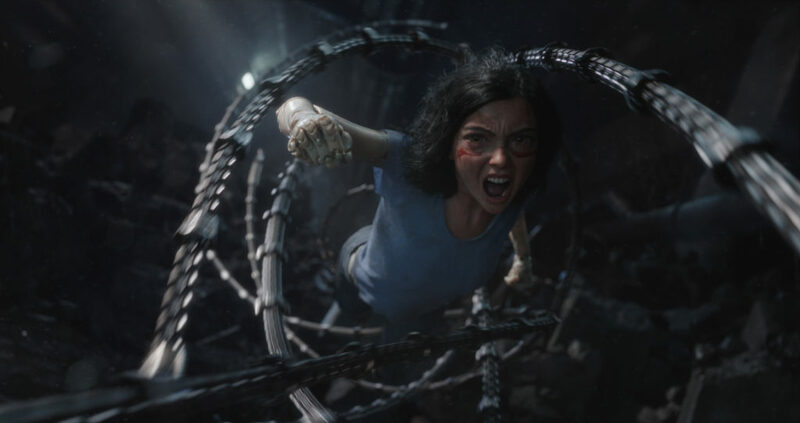 Making use of panning shots when Ido finds Alita in the scraps allowed the graphics to manifest into a realistic setting. The film isn’t without its flaws, however. The cast of villians was far too crowded and, past a certain point, detracted from the overall story. New villians are introduced in numerous scenes, yet the plot progressed rapidly without providing closure for each one. The only real closure regarding the many antagonists occurs in the last 15 minutes of the film, culminating in a slough of fight scenes. Likely due to the adaptation of a long manga, the story left the audience questioning where those characters went. The pacing and cast performances sometimes compensated for the confusing line of villains, but the film often left you questioning who the main antagonist really was. Overall, the film developed the storyline between plenty of violent action scenes that were neatly spread out to keep the audience entertained. The strong performances by Salazar and Waltz, and the astonishing graphics, make “Alita: Battle Angel” an audience-pleaser for those looking for a fast-paced new take on the dystopian film genre.